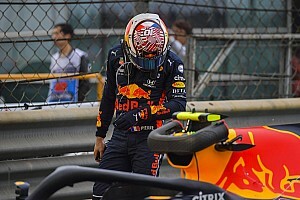 Earlier, Courtney had been in tears after her father's fiery crash – his second in two events – but she regrouped to take a famous victory. 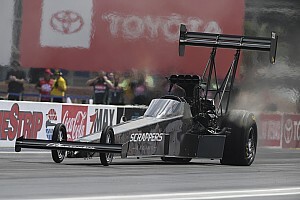 Steve Torrence (Top Fuel) and Chris McGaha (Pro Stock) were also winners in their respective categories. 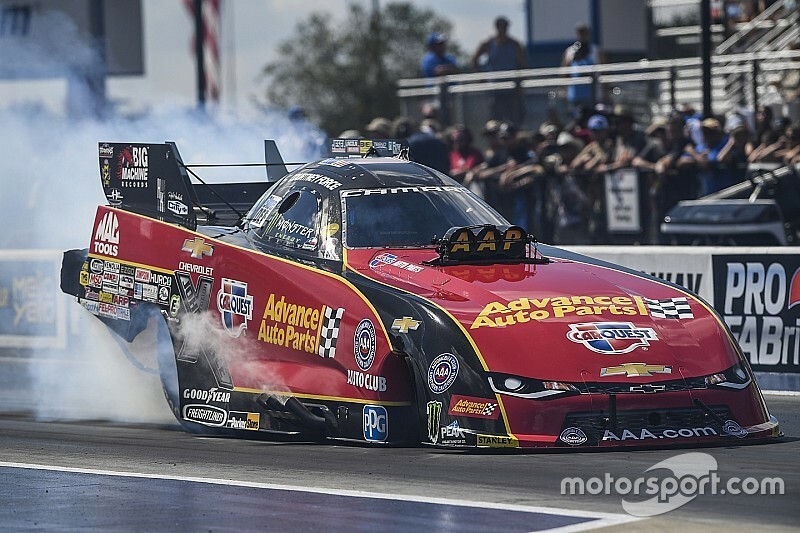 Force emerged victorious with a run of 3.834 seconds at 337.16 mph in her Advance Auto Parts Chevy Camaro to take down Tommy Johnson Jr. in the final round. After earning the No. 1 qualifier on Saturday, Force secured her first victory since Houston 2016. After setting both ends of the track record on Saturday, Force took down Del Worsham and Matt Hagan before taking a solo pass in the semifinals as she raced to her first win in 2018. Tommy Johnson Jr. overcame defending Funny Car world champion Robert Hight, Richard Townsend and Shawn Langdon en route to his first final round of 2018. John Force was involved in an incident during the second round of eliminations Sunday after his Peak Chevrolet Camaro SS suffered an engine explosion, went out of control, made contact with the retaining wall and collided with Jonnie Lindberg. Force was responsive, speaking with medical personnel, and was transported to a local hospital for evaluation. Torrence powered his Capco Contractors/Torrence Racing dragster to the Top Fuel victory with a run of 3.729 at 330.72 to take down Scott Palmer in the final round. After locking down a career-best eight victories in 2017, Torrence recorded a victory in Phoenix for the first time in his career. Torrence qualified second on the weekend and defeated Steve Chrisman, Blake Alexander and his father, Billy Torrence, on his path to victory. Palmer secured the No. 12 qualifying spot and took down Richie Crampton, Leah Pritchett and Greg Carrillo as he reached the first final round of his career in Top Fuel. McGaha drove to the winner’s circle with a 6.529 at 211.59 run in his Harlow Sammons Chevrolet Camaro to defeat Jason Line in the final round. He secured his sixth career victory and first since winning the Four-Wide Nationals last season in Charlotte. McGaha was the No. 7 qualifier as he was victorious against Tanner Gray, Erica Enders and Alex Laughlin as he earned his first victory of the season. 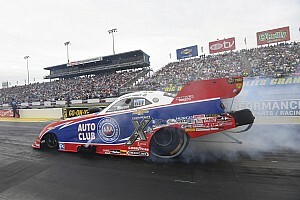 Line qualified fifth on the weekend and beat Vincent Nobile, teammate Greg Anderson and No. 1 qualifier Deric Kramer as he notched his second consecutive runner-up finish to open the year. The 2018 NHRA Mello Yello Drag Racing Series season continues with the Amalie Motor Oil NHRA Gatornationals at Gainesville Raceway March 15-18 in Gainesville, Fla.
1. Steve Torrence; 2. Scott Palmer; 3. Billy Torrence; 4. Greg Carrillo; 5. Blake Alexander; 6. Brittany Force; 7. Antron Brown; 8. Leah Pritchett; 9. Mike Salinas; 10. Troy Buff; 11. Tony Schumacher; 12. Richie Crampton; 13. Clay Millican; 14. 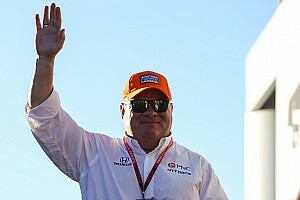 Doug Kalitta; 15. Terry McMillen; 16. Steven Chrisman. Final: Steve Torrence, 3.729 seconds, 330.72 mph def. Scott Palmer, 6.449 seconds, 102.70 mph. 1. Courtney Force; 2. Tommy Johnson Jr.; 3. Shawn Langdon; 4. John Force; 5. Matt Hagan; 6. Ron Capps; 7. Richard Townsend; 8. Jonnie Lindberg; 9. J.R. Todd; 10. Tim Wilkerson; 11. Robert Hight; 12. Bob Tasca III; 13. Del Worsham; 14. Cruz Pedregon; 15. Jeff Diehl; 16. Jack Beckman. Final: Courtney Force, Chevy Camaro, 3.834, 337.16 def. Tommy Johnson Jr., Dodge Charger, 6.814, 101.57. 1. Chris McGaha; 2. Jason Line; 3. Alex Laughlin; 4. Deric Kramer; 5. Greg Anderson; 6. Drew Skillman; 7. Erica Enders; 8. Jeg Coughlin; 9. Bo Butner; 10. Val Smeland; 11. Kenny Delco; 12. Tanner Gray; 13. Alan Prusiensky; 14. Steve Graham; 15. Matt Hartford; 16. Vincent Nobile. Final: Pro Stock -- Chris McGaha, Chevy Camaro, 6.529, 211.59 def. Jason Line, Camaro, 6.538, 210.14. 1. Steve Torrence, 183; 2. Doug Kalitta, 144; 3. Tony Schumacher, 140; 4. Scott Palmer, 139; 5. Antron Brown, 133; 6. Clay Millican, 122; 7. Leah Pritchett, 90; 8. Brittany Force, 86; 9. Billy Torrence, 71; 10. Greg Carrillo, 66. 1. Matt Hagan, 179; 2. Courtney Force, 160; 3. Ron Capps, 139; 4. Robert Hight, 133; 5. Tommy Johnson Jr., 128; 6. Jack Beckman, 122; 7. Jonnie Lindberg, 107; 8. Shawn Langdon, 104; 9. J.R. Todd, 83; 10. Cruz Pedregon, 82. 1. Jason Line, 195; 2. Deric Kramer, 154; 3. Chris McGaha, 152; 4. Bo Butner, 149; 5. Alex Laughlin, 136; 6. Erica Enders, 134; 7. Greg Anderson, 119; 8. Drew Skillman, 117; 9. Vincent Nobile, 95; 10. Jeg Coughlin, 84.